Those were probably the last words Lena Williams expected to say to her husband on Christmas Eve 1911. Around 6:45 pm that evening she and Hillas, who was on his way to his job as a printer at the Globe, boarded an overcrowded streetcar at Queen and Broadview. The vehicle was running late thanks to the breakdown of another streetcar along the King route, and it had been forced to take on hordes of passengers who were winding down their Christmas shopping or on their way to or from church. Minutes later, thanks to a track switch left open on the other side of the new Don Bridge, the streetcar the Williamses were on became, as the Star termed it, “a house of death.” As the runaway vehicle hit the switch and veered from King Street onto St. Lawrence Street, Hillas tried to grab Lena, but she was thrown out of the streetcar and fractured her skull on the road. Hillas found her pinned against the side of the vehicle with three other women lying on top of her. “I spoke to her,” he told his employer, “and she answered that she feared she was seriously injured.” Lena spoke her final words, then fell unconscious. She was taken to Toronto General Hospital but died shortly after arrival. Lena Williams was the second fatality resulting from the crash of Toronto Railway Company (TRC) streetcar number 1502 on December 24, 1911. The accident darkened the holiday season a century ago as columns of newsprint provided grim details from eyewitnesses and survivors. William Moore, who had been a motorman for the TRC for 18 months, arrived slightly late for work on Christmas Eve and found himself switched from the Broadview streetcar he normally operated to the King Street route. A breakdown around 6 p.m. forced Moore to go to the TRC barn south of King Street near the Don River to pick up a new vehicle. The six-minute gap in service led to crowds at obligatory stops stretching along Queen Street East to Woodbine Avenue. During the return trip, streetcar inspector Christopher Noble boarded the vehicle at Leslie Street and told Moore to skip several stops to make up for lost time. By the time the streetcar pulled away from Broadview Avenue and headed onto the Don Bridge, it carried around 120 passengers, 70 more than official capacity. 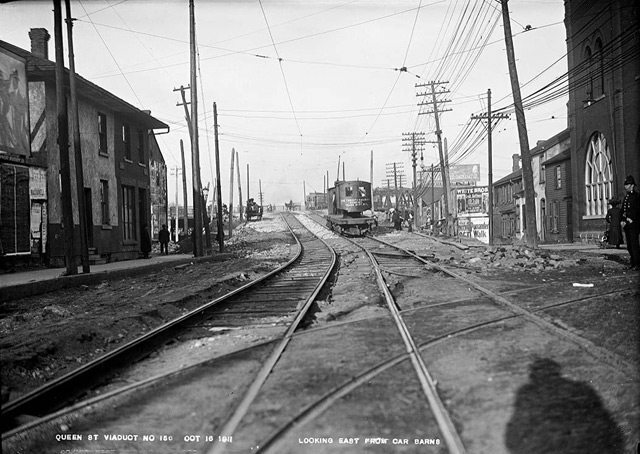 King Street looking east to Don Bridge from car barns, October 16, 1911. City of Toronto Archives, Fonds 1231, Item 487. The holiday weekend was the first for a new track switch on King Street a few feet east of St. Lawrence Street, which was designed for vehicles heading to the car barns. Normally a TRC official would have been on duty to supervise the switch, but TRC policy, influenced by Toronto’s abhorrence toward work on the Sabbath meant that on a Sunday like Christmas Eve 1911, motormen were on their own in ensuring it was in the correct position. Unfortunately, the switch was placed in a poorly lit location. As Moore guided the streetcar down from the bridge, he applied the air brake, then turned the power off to allow the vehicle to glide along the grade. As its speed increased, he turned the power back on and attempted to brake for an obligatory stop near the switch but, as he later testified in court, discovered it didn’t work. Passengers grew edgy as they received a thrill ride they weren’t expecting. Witnesses estimated the streetcar was moving at 25 miles per hour by the time it hit the switch, which had been left open by a previous vehicle. When he saw the switch, Moore threw on the emergency brake, which slightly slowed the vehicle before it reached the curve onto St. Lawrence Street. The force tossed passengers to the right side of the vehicle, which caused it to jump the track and land on its side. As soon as the arm left the trolley wire the lights in the car went out and pandemonium reigned. Those on the rear platform were shot from the back as if from a mighty sling, while inside the passengers were hurled in a pile near the stove and in the front vestibule, which is not separated from the main body of the car. Broken glass and pieces of wood were showered upon them and very few escaped injury. The situation could have been worse: a streetcar heading east along King Street almost smashed into the fallen vehicle, but the motorman successfully used his brakes. I ran over and through a trap door in the bottom of the car pulled out eight girls and five men. It was an awful scene. The car was dark and full of people, those who were trying to get out through any little aperture. When we had pulled out all who were and had a chance to get at Mrs. Deacon we found that a large part of the car’s weight had been thrown upon her. She was found near the front of the car and lying with her right arm and part of her body nailed under a window frame. The wrecking crew jacked up the rear end of the car to liberate five or six who were pinned under the upright bar on the rear platform…I helped to pull Mrs. Deacon from under the side of the car and take her into the store at the corner, where she died five minutes after. Jessie Deacon’s death from a fractured skull was the second tragedy in as many days for her husband Alfred. A commander and engineer in the British Navy, Deacon was on an extended leave of absence to care for his ailing mother in Toronto, who died at her home on the morning of December 23, 1911. On Christmas Eve, the Deacons boarded streetcar 1502 at Kenilworth Avenue to attend a service at St. James Cathedral. It was later reported that Jessie had a premonition that she would never see her home country again, despite the couple’s preparations to return to England the following week. While Jessie Deacon and Lena Williams were the only fatalities, over twenty passengers were hospitalized, several in critical condition. The most seriously injured were Frances Bayne, who lost the use of her arms, and Robert Hall, who was considered close to death for several weeks before recovering physically but remained amnesiac about the accident. During the coroner’s inquest into Jessie Deacon’s death, the TRC’s practices were scrutinized. King Street division supervisor Alexander McDonald was reluctant to answer any questions during his testimony. His statements were greeted with laughter among observers at the city morgue, especially his claim that the streetcar wasn’t overcrowded, just “fairly full” and that more passengers could have fit comfortably on a vehicle carrying more than double its capacity. Jurors learned that there weren’t any rules restricting how fast a streetcar could go, and that no printed training guide existed for motormen—they were expect to learn on the job from their more experienced peers. Moore was very frank. He tried to hide nothing, but on the other hand answered the questions put to him as quickly as possible. He looked worn before being called, and after being cross-examined for so long, became too tired and weak to grasp the meaning of the questions, yet answered as best he could. Despite a barrage of questions from the crown attorney designed to make him confess to reckless driving, Moore maintained that the vehicle was only going eight miles an hour as it crossed the bridge and that he tried to avoid an accident. When repeatedly asked why he didn’t apply the emergency break sooner, Moore indicated that doing so put passengers at high risk of injury, and that until the air brakes failed he saw no danger. He admitted he was unable to see the poorly lit switch in the dark. Moore’s testimony impressed the jury, and they granted Moore bail. His case was aided by other experts who testified that it was easy for brakes to seize up due to dust or parts breaking off while in operation. That Jessie Deacon came to her death on December 24 by being thrown from and crushed under car No. 1502, which was overthrown at the corner of King and St. Lawrence streets, Toronto. 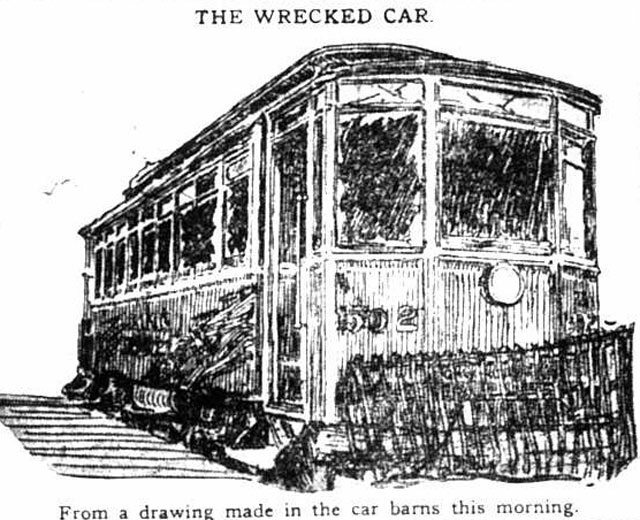 That said car was owned and operated by the Toronto Street Railway Company. That the overturning of the said car was caused by: (a) Being heavily weighted, due to overcrowding; (b) By the excessive rate of speed being caused by the failure of the motorman to control said car owing to the temporary demoralization of the air brakes, the excessive rate of speed being due to acceleration acquired by the motorman of the said car coming down grade westward of intersection of Queen and King Streets. The jury recommended that the TRC needed to regulate the number of passengers allowed on their streetcars, install proper lighting at switches, and provide printed rules to all streetcar operators. All charges against Moore were dropped. In the long run, the accident heightened awareness among Torontonians of the deficiencies of the TRC and aided the efforts of those who wanted to bring the city’s transportation system under public control. As for the Williamses, Hillas was forced to leave the wife whom he had married five months earlier. He agreed to have Lena’s remains buried in her hometown of Perth, Ontario. Additional material from the December 25, 1911, and December 29, 1911 editions of the Globe; the December 25, 1911 edition of the Mail and Empire; the December 26, 1911 edition of the News; the December 26, 1911, January 12, 1912, and March 1, 1912 editions of the Toronto Star; the December 26, 1911 edition of the Telegram; and the January 6, 1912, January 10, 1912, January 12, 1912, and January 18, 1912 editions of the Toronto World.